My heart just breaks for Steven Curtis Chapman, his son, and his family in the loss of their five year old daughter. Father, comfort their hearts. I want some pas-ta, baby this evenin' "
1. As I was walking out the door to run errands, I was reminding Caroline to help her daddy by being a good hostess to her company. She reassured me that she would be "the most-est." That's my girl! The hostess with the most-est. 2. While at youth group rather than chiming in with amen at the end of the blessing, she joyfully closed with "Man!" 3. Over the past few days she has been over-enunciating her L's in every word that has one. Don't know what that's about but it's quite cute. 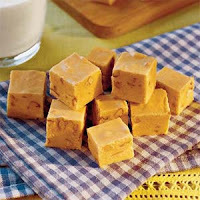 My sweet friend and neighbor Cindy just surprised me with pumpkin fudge! Love this stuff! Thank you so much for the gift, girlfriend! Nope, not a comment about an old Cheers episode. Just wanted to share that while peering into her mother's super-magnified-eyebrow-tweezing mirror Caroline noted that her eyes are "woody" and have "cracks." Translation: She has the most beautiful bright brown eyes, and if she has cracks then her momma has canyons. Aimee and Chris inspecting Molly's nose. On Sunday Caroline couldn't wait to wish me a happy Mother's Day with a huge smile spread across her face. A sweet surprise as she is not one to usually greet the day singing! My darling hubby fixed my favorite breakfast, French Toast, and at my request lots of coffee. After church I took a really long nap and watched a movie from Netflix that I have had for six months! (Oops.) My fam also surprised me with two rose bushes and a white porch swing for our front porch. Can't wait to sit on the veranda sipping my java with an excessive amount of French vanilla creamer! Lastly, we headed off to the Fields' where my sweet Daddy-in-law grilled steaks and strongly suggested that we could not have gotten a better dinner anywhere else! (Maybe because we were supposed to meet them out for dinner, but that's a different story.) Oh, and let me not forget that Donald's mom makes amazing potato salad! It was a really nice visit. I especially liked listening to David recount stories of his grandmother and his experiences of growing up in the coal fields of WVA. This is what the kids made for their Grandmas. To top off the day, my darling stayed up late with me to watch the movie 27 Dresses! I love my man! Thanks darling, for giving me such a special day. I know that behind this "great" mom stands an even better dad. OK, just signing back on to say I cannot pop my mini bunt cakes out of their mini bunt nonstick, sprayed molds. Nice. Caroline just asked me if the piece of overflow cake she was eating had bones in it. Really nice. Apparently she had a crunchy piece. I am now realizing that my last baking disaster, A.K.A. "Playgroup's Brown Sugar Pound Cake" was also made in a bunt pan. Anyone want a bunt pan? It's been an exciting few weeks for The Fields. New Vocab: "tractor" and "kitty cat"
We started brushing his teeth. All 10 of them! Mastering all sorts of new skills from waving to drinking from a cup. We're pretty run of the mill these days. Donald has been brushing his teeth for awhile now and I'm still working on my pirouettes. I've been dying to show off my find from the Meals on Wheels yard sale -- two sterling silver bracelets for a whopping total of $1. Whoo-hoo! I usually skip the jewelry at yard sales too, but having arrived extra early and not wanting to appear overly eager I decided I could afford to slowly peruse the jewels for a bit since they were the first exhibit. I'm so glad I did, although the lady in front of me at the checkout found a brand new, still wrapped in plastic Cuisinart ice cream maker. Lesson learned: pride cometh before a yard sale loss!